The application of contingency buffer, more commonly known as “padding” or “management reserve” is the final step in any project estimation process. The most common practice is for the estimator to use an intuitive multiplier which is added to base estimate. Unfortunately, everyone has a different multiplier which is shaped by their own personal bias about risk and it is hidden in their head. This creates a fundamental problem with transparency and consistency within most organizations. Fortunately, there's a better way. One solution is to define and configure agreed upon standards that are matched to specific business risk situations. These should be collaboratively agreed to by all the stake holders in the organization. Then they can be codified into a configuration that can be selected at the time when contingencies are typically applied to an estimate. This helps solve the consistency issue. 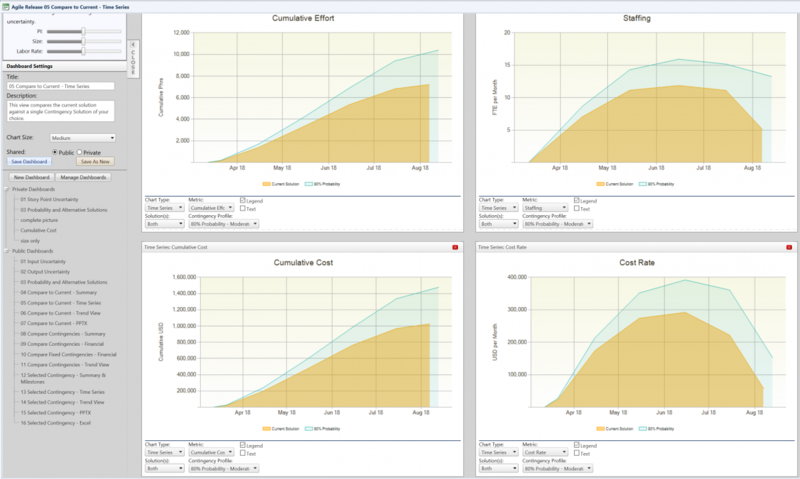 To attack the transparency issue, you can use a technique of overlays to visualize the contingency in comparison to the base estimate. In the graphic above, our base estimate is shown as the yellow colored profile. There are four time series charts. They are cumulative effort, cumulative cost, monthly staffing, and spending. The green overlays in the background are 80% probability estimates. In other words, we are 80% confident that the estimate would not exceed these values. Typically, an 80% scenario would equate to moderate business risk where there could be some issues with ill-defined requirements or team experience or technology risks. In this example, we look at 80%, but it is easy to select 65% or 95% using the drop-down list from the preconfigured alternatives. This allows you to see and understand how much buffer gets applied with each of those contingency profiles enabling you to decide the best match of contingency to the business risk situation. If you have problems with the consistent and transparent application of contingencies to deal with very real business risks, then try the overlay approach. You will have much better insight into what is being proposed and you will make better decisions on what contingencies map best to different business situations. Give it a try. You will be surprised how well this technique works.